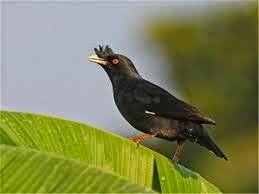 The Myna , crested myna, house myna, house mynah, Indian myna, Indian mynah are common names of myna. 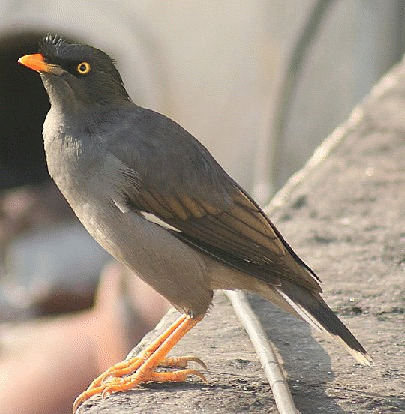 The common myna has adapted well to the urban environment, making it one of the most abundant and familiar birds in Asia and is an aggressive and confident bird. This well-known bird has distinctive chestnut-brown upper parts, with a glossy black head, brownish-black upper-wings and a white-tipped black tail . 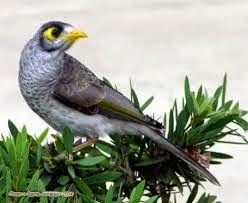 The bill, legs and the bare skin around the eyes are bright yellow, and bristly feathers on the forehead form a short crown . 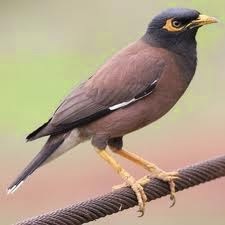 This large, stocky myna also has contrasting white patches on its wings, which are most visible when the bird is in flight . 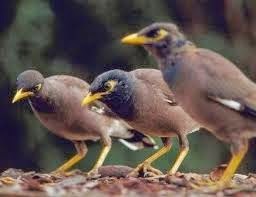 The male and female common myna are very similar in appearance, although the male is usually slightly larger, but the juvenile bird is duller than the adult, with browner plumage, and lacks the glossy sheen on the head . 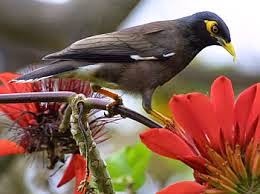 Like other birds of the Sturnidae family, the common myna has large and strong feet that allow it to walk on the ground rather than hop, while the stout, straight bill enables it to be fairly flexible in its food choice. 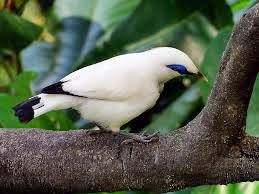 The common myna is highly vocal at all times, and can also be identified by its ceaseless, loud chattering of various conversational-like gurgles and whistles, and it is even capable of learning to mimic human speech when in captivity . 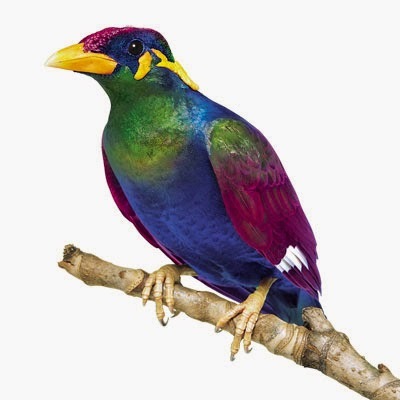 The common myna consumes a wide variety of food types, including frogs, snails, birds’ eggs and nestlings and other animal matter, as well as fruits and seeds. Typically, it scavenges on the ground at refuse heaps in urban areas, and in rural areas it is often found following ploughs to feed on upturned insects. It also regularly settles on the back of cattle to remove ticks from them. During periods when insects are scarce, fruits and seeds make up most of its diet, and at such times the species can become a serious agricultural pest. 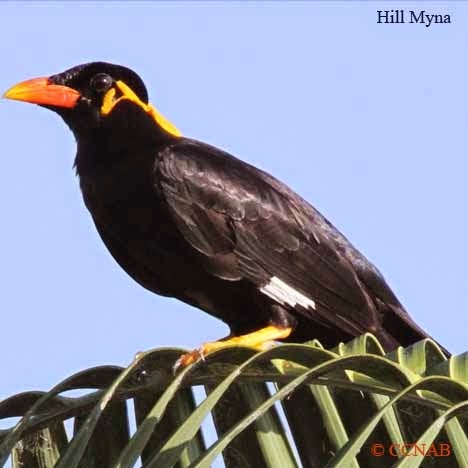 As a highly sociable species, the common myna often feeds in small flocks, as well as gathering into large roosts that sometimes comprise tens of thousands of birds . 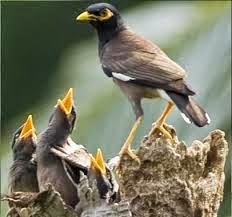 The timing of breeding in the common myna varies greatly across its range, but the breeding season generally runs from April to July in India . Pairs form at the start of each season and usually mate for life, with a small territory around the favoured nesting site defended each year . 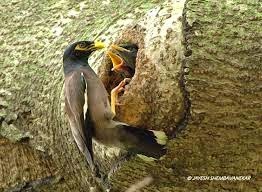 The male and female cooperate to build an untidy cup-shaped nest out of twigs, grass, leaves and refuse in a cavity of a tree or building, or in a hole in an earthen bank or cliff. 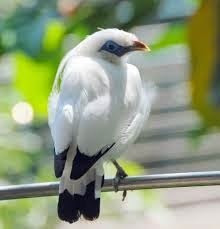 Usually 4 to 5 eggs are laid and incubated, mostly by the female, for 13 to 18 days. The chicks fledge after around 22 to 27 days in the nest, but continue to be fed by the adult birds for up to a further 3 weeks. 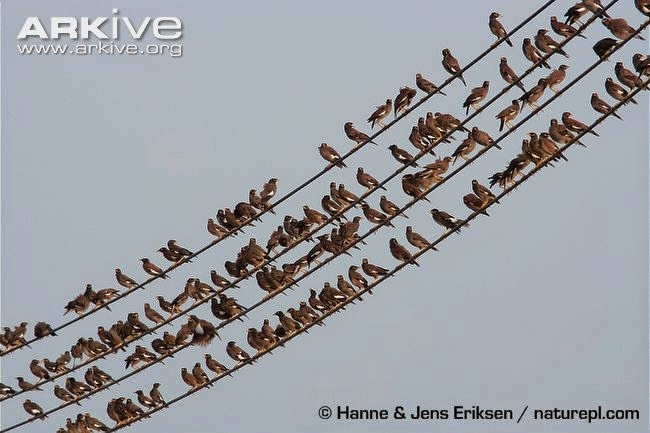 The young birds reach sexual maturity at a year of age, with an average life expectancy of around 4 years in the wild, although some individuals may reach 12 years of age . 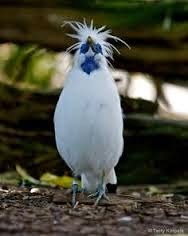 Birds sing so early in the morning ?